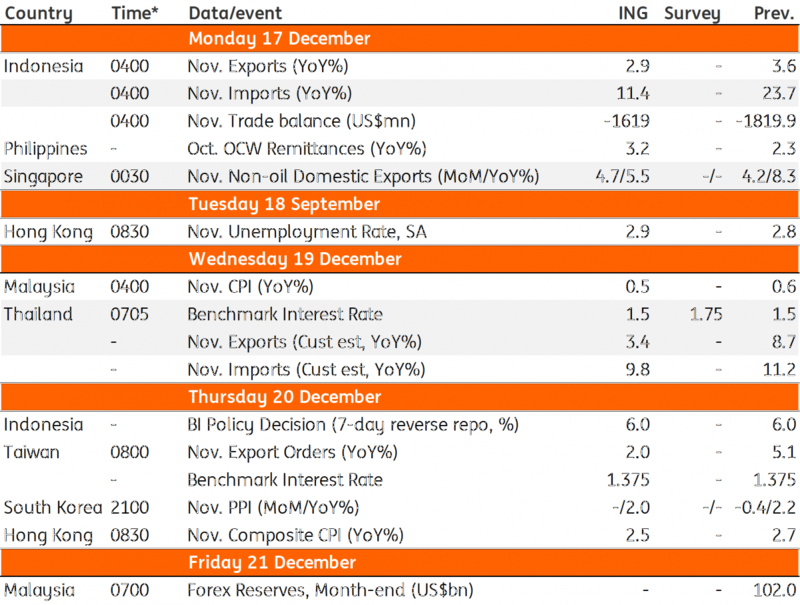 Central banks in Japan, Taiwan, Indonesia, and Thailand hold their monetary policy meetings. While the first three are widely expected to leave policies unchanged, the odds of the Thai central bank seem to be balanced between staying on hold and a 25 basis point hike next week. 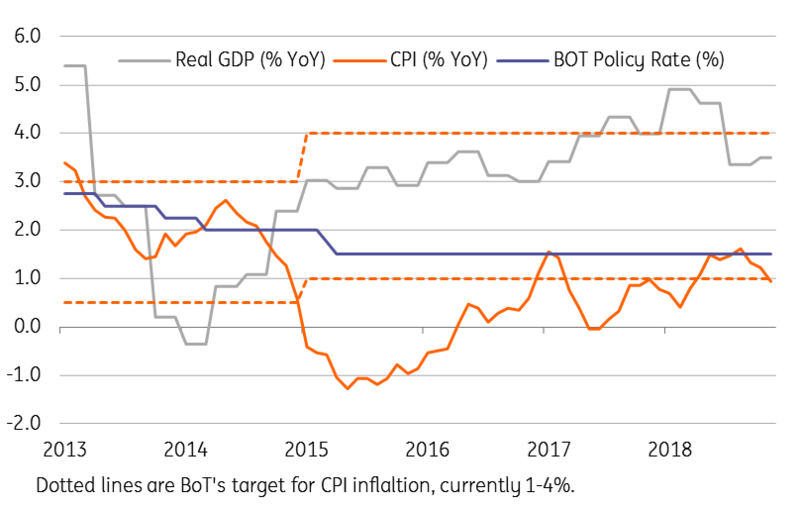 Thailand’s economy doesn't need higher interest rates, but the central bank may want to create some policy cushion for the economy if growth takes a further hit. Still, we believe the Bank of Thailand has missed the boat. Growth has already started to slow down and inflation has dipped below 1% - not really the right time to change policy. Elsewhere, consolidation of the Indonesian rupiah in November after a heavy sell-off earlier in the year gives some stability to the central bank after a total of 175bp rate hikes since May this year. And there are no real economic grounds for Japan and Taiwan's central bank to change policies just yet, maybe not until we're in the new year. 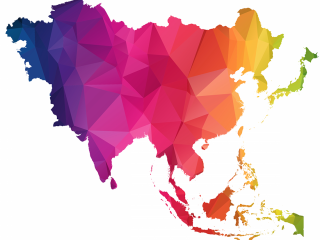 November trade releases from Japan, Indonesia, Singapore, and Thailand will be in focus for any trade war impact. The impact is becoming apparent, slowly but surely, as we've seen from weak November exports from northeast Asia including China, Korea, and Taiwan. 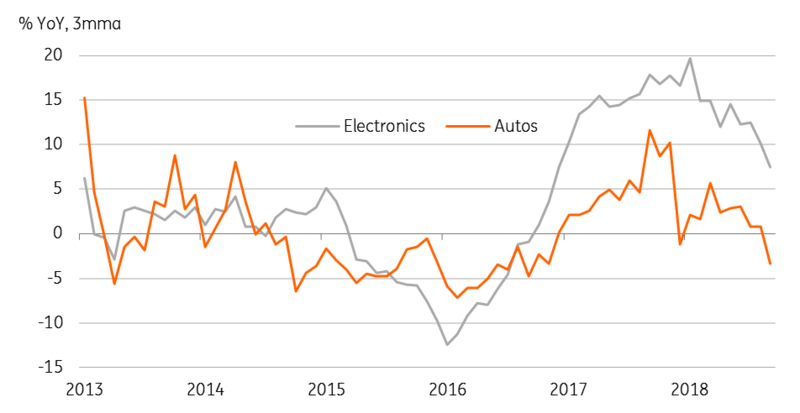 Besides the US-China trade war, a potential downturn in global electronics foreshadowed by the recent sell-off in electronic stocks also weighs on regional exports. Electronic exports from Korea are still growing on an annual basis, but those from Japan, Singapore, and Thailand have either been flat or declining. Not only electronics, but weak automobile demand has been an added drag on Japan’s and Thailand’s exports. Indonesia’s persistent trade deficit remains the main negative for the rupiah. However, if materialised, the expectation of some narrowing of deficit to $1.6bn in November from $1.8bn in October should be some relief for the central bank. Aggregate electronics exports from Japan, Korea, Taiwan, Singapore, Malaysia and Thailand; automobile exports from Japan, Korea and Thailand.